Adobe have just opened up a public beta of a revamped version of Dreamweaver offering a lot of improvements and useful features for modern web development. Dreamweaver’s had it’s share of flack over the years and not all unwarranted, but this new beta looks to shed some of the baggage of its 19 year history with a refreshed user interface and a new code editor based on the Brackets codebase. For someone like me who spends most of the time in code view (and who has split their time between Brackets and Dreamweaver for the last year or so) there’s some nice new features in there that make it a more compelling environment for code-first users. I wrote a post "My thoughts on Adobe Edge" back in August last year which looked at Edge Preview 1 where I was mainly interested in seeing how the output of Edge compared with Flash in capability, size and efficiency. Since then Adobe have been regularly updating the Preview releases for Edge and have just released Adobe Edge Preview 5, since the initial Preview 1 release – which was pretty bare bones in regard to functionality – they have added a lot of new functionality. 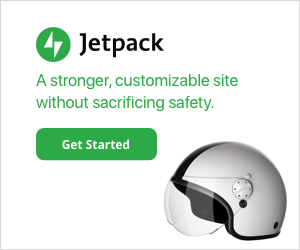 Publish to Web — Optimize your content for deployment by specifying if jQuery should be packaged with the composition, or downloaded from a CDN to improve caching.Edge also transforms the _edge.js file, and minifies both the _edge.js and _edgeActions.js files, resulting in significantly smaller files. Down-level Stage for non-HTML5 Browsers — Use the new down-level stage to design static (non-animated) compositions that are compatible with older non-HTML5 browsers such as Internet Explorer 8 and below. It’s good to see the minification capabilities added as this definitely helps deal with the size issue that I highlighted in my Preview 1 post. I think there’s probably still a load of work to do in minimising file sizes as this is especially important for mobile devices. I’m keen to see what new features are added in future Preview releases, one issue is in regard to responsive web layouts and how content created in Edge can possibly adapt to the dimensions of the device / browser window that it is viewed in, again for mobile access this is very important. One other feature that would be very good is some way to reproduce the masking capabilities that is possible in Flash, in particular the ability to apply a non-square mask over some content. It is possible to clip content but this uses rectangular clipping by limiting the overflow of a containing div to be hidden. I can’t see how non-square cropping would be possible with the limitations of current CSS3 capabilities, I’d happily be proven wrong on this though. Many tools are now being developed to make the creation of these experiences much easier (Edge, Sencha, Hype, MotionComposer, Animatable(2) etc). However, there’s a potential danger lurking under the surface with these apps and the many demos and samples showing off these new shiny features: Machine Generated Code. The content created might be made using web standards like HTML5, CSS3 and SVG but in reality it fails in exactly the same way that Flash does — poor / non-existant semantic structure and a lack of accessibility(3). Is that code any better than the code that is generated by iWeb? It’s possibly worse. How can a company like Google who has incredibly talented developers end up with code like that? Well, in Google’s case it was written using a templating system that uses Closure, these templates are converted by java on the server into HTML(4). Nothing inherently wrong with that process but the end result is HTML that is machine-friendly but is not really intended to be easily readable by humans. (Of course a counter-argument is that clean semantic HTML code doesn’t apply to web apps as they are ‘more complex’ than ‘regular’ websites! That’s something for further discussion). So, is there a solution to this? Well, the first solution is to consider these issues yourself. If you’re evaluating tools like Edge, Sencha or evaluating development frameworks then pay close attention to the code they create. If it seems to be falling short then take the time to give feedback to the companies behind them. In the case of Adobe’s Edge tool which is currently an early preview release on Adobe Labs then there is an opportunity to give feedback on the app and influence it at an early stage of development. Don’t just whine about it on Twitter but take the time to give feedback and clearly explain what you think is wrong and how it can be improved. Talking of people whining on Twitter, I wrote this article and had it all pretty much ready to publish when Adobe released another product on Adobe Labs, Muse. Although the main focus of this article is on the more interactive, dynamic flash-esque content creation applications that have been appearing I couldn’t really post this article without briefly mentioning Muse (I did mention iWeb and talk about Google+ after all, both of which obviously don’t fit that category of app). Muse definitely renders Machine Generated Code as it’s sole aim is to enable visual designers to “Design and publish HTML websites without writing code”. I have to admit that the first thing I did when viewing the Muse website (which is itself built with Muse) was to view source, and sadly I was disappointed with what I saw there – lots of nested divs, generally bloated looking content, and despite purportedly being ‘HTML5’ there were no HTML5 structural tags to be seen. Many WYSIWYG apps have come and gone and have never managed to produce good clean code without requiring the user to intervene and clean up code, this doesn’t mean it’s impossible to create such an app, but it’s definitely a big challenge. As with Adobe Edge I’d recommend taking time to give good, reasoned feedback about what you consider is wrong with the output it produces, don’t just complain about it on Twitter. “Using web standards means first and foremost one thing: delivering a clean, professional job. You don’t write clean markup for the browser, you don’t write it for the end users. You write it for the person who takes over the job from you. Much like you should use good grammar in a CV and not write it in crayon you can not expect to get the respect from people maintaining your code when you leave a mess that “works”. 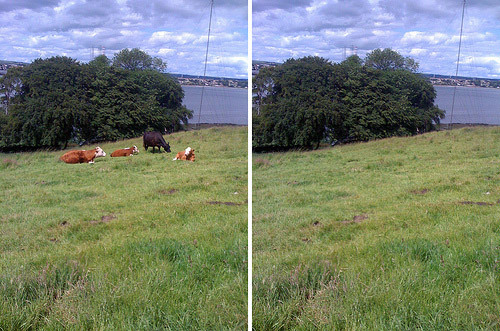 1: By post-Flash I mean as the only way to do interactive animated content on the web. 3: I acknowledge that it is possible with recent versions of the Flash player to make Flash content that is more accessible, but generally Flash’s integration with Screen readers like Jaws etc is not great, and you have to specifically apply settings to the Flash content to help it be accessible. 4: This information about Google+ development and other interesting info from this thread. I just happened to be playing around with Flash this morning messing around doing a little shape tweening with a couple of symbols I found over on The Noun Project website so I thought I’d use that FLA file and see how Wallaby coped with it. After starting Wallaby you get a very simple interface, a file select field that you use to select the FLA file and a large Status area that shows any errors and warnings encountered whilst converting your file. There are also Preferences that can be set which at the moment include automatically opening the converted file in your default browser and enabling logging. After selecting my FLA file I clicked ‘Convert’ and after a few seconds it happily converted my file without any errors or warnings. I was interested to see what it would make of the shape tweened animation that I had made in Flash as this seemed like quite a challenge to convert. That’s a total of 372kb in order to recreate the tweened animation in HTML / CSS / JS / SVG. 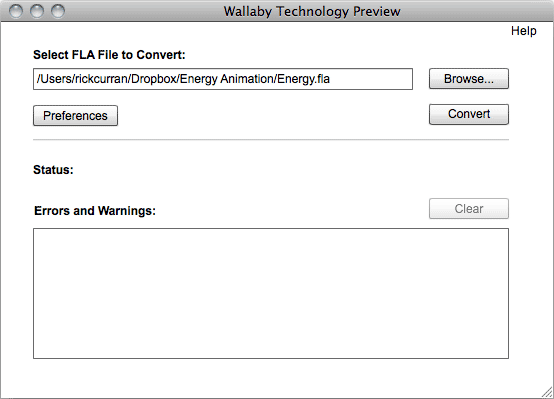 Even with that it’s still only a total of 17kb, about 1/20th the total size of the files that Wallaby outputs. That’s about half the size of the Wallaby output. It’s also likely to playback much better on mobile devices such as iPhone / iPad / iPod touch as Adobe warn that the output of shape tweened animation can result in playback performance difficulties on iOS devices. This adds 201kb to the total file size required so that brings it to about 393kb, almost the same as Wallaby’s HTML5 output. I’m sure there are possibly slimmer options compared to JWPlayer for embedding that could reduce that down a bit but I reference JWPlayer as I consider it to be one of the best cross-platform methods of embedding video on website. Of course I haven’t mentioned anything about delivering video in alternative codecs such as Ogg Theora or WebM to serve browsers like Opera, Firefox and Chrome, this would further increase the files and sizes involved. However, given that Wallaby is trying to provide a way for animated content created in Flash to be output and made playable on devices such as the iPad and iPhone it could also be considered that providing any kind of Flash fallback for video is unnecessary, so we could ignore the JWPlayer / JS completely and just use the regular HTML5 <video> tag and a single H.264 video, so we’d be back to a considerably smaller size than Wallaby’s output in this instance. Overall Wallaby looks to be a pretty handy tool for people that are struggling to find a way to get their content viewable on the millions of devices that don’t (and likely never will) run Flash. For animation that doesn’t involve shape tweening I think the resulting file sizes will be a lot more favourable and it will be a reasonably efficient way to create animated content using standards-based technology. 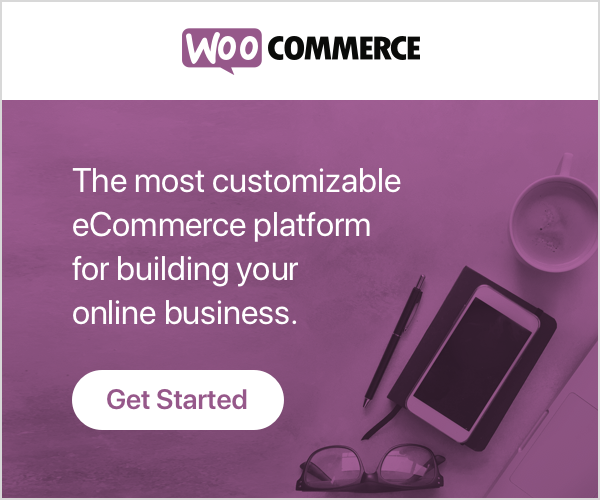 I would say that the primary target user for Wallaby, at least at first, is for people doing online advertising. This is an area that is seeing a lot of activity with tools like Sencha Touch appearing, there’s definitely opportunity for a ‘killer app’ that makes creating banner advertising using all of these new emerging web technologies in a way that people are used to doing in the Flash IDE. There’s a lot of challenges in there technically, as well as a lot of issues such as accessibility, graceful degradation etc, but I think a lot of companies are focusing on this challenge now, so it’s good to see that Adobe is thinking about various ways of providing tools for the job. 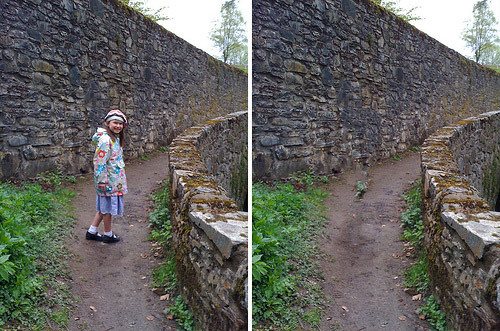 I posted these examples of Photoshop CS5’s new Content Aware Fill function to my Flickr account a few weeks ago but I thought I’d post them here too. I’ve just started exploring all of the apps in the CS5 Master Collection so I might post a few other experiments from Photoshop and other apps as well. Click on the images to view a larger version. Adobe have just announced the new version of their Creative Suite software, CS5 adds a whole range of new features across the whole range of their applications. Dreamweaver CS4 did bring some improvements with the addition of the WebKit framework as the rendering engine for Design view and Live view which solved a lot of the HTML / CSS rendering issues and added support for many of the CSS features that WebKit supports. Dreamweaver CS5 takes those steps a good deal further and now adds greatly improved PHP Code Hinting which can discover your own PHP functions and classes as well as those in CMS frameworks WordPress, Drupal and Joomla. The major benefit of this for the Design view and Live view is that instead of a jumbled mess of un-renderable PHP and HTML code you get the actual site running right inside Dreamweaver. When you combine this with the new Inspect mode you get the ability to inspect elements on your page and see the CSS properties used, it’s very similar to some of the features offered by the Firebug add-on for Firefox or Web Inspector inside Safari. 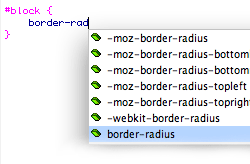 The combination of these features together make it a huge leap forward for code-based designer / developers like myself. If you’ve previously been put off by the rendering aspect of Dreamweaver before then it’s definitely worth checking out again. What about HTML5, CSS3, Web font support? There’s been a lot of noise about HTML5, CSS3 and Web Fonts (@font-face) in recent months, not least because of the prominent debate over Flash support on iPhone OS devices. A lot of people might expect Dreamweaver to add support for HTML5 and CSS3, however, at first glance you might be a bit disappointed. David Powers over on the FoundationPHP blog wrote a great writeup of Dreamweaver CS5 in which he makes a valid point about the lack of prominent support for HTML5 and CSS3. The HTML5 and CSS3 standards are still evolving so it’s difficult for any IDE to add support for them without the risk of something changing or breaking, especially with the HTML5 standard. Dreamweaver CS5 does however offer support for using the HTML5 doctype for your documents, also the WebKit framework used in Design view and Live view will also render many of the CSS3 features that the WebKit framework supports, so if you’re writing code by hand then you can still use and preview many of these CSS properties. 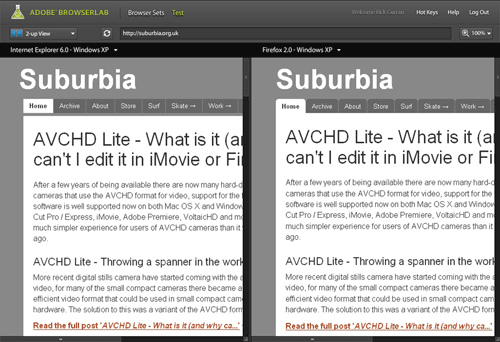 (The screenshot above shows https://suburbia.org.uk viewed right inside Dreamweaver’s Live View, note the TypeKit fonts rendering happily inside Dreamweaver’s WebKit based Live view). Web Fonts are still a hot potato in many ways so as yet there is no direct support for adding those within Dreamweaver, but again WebKit will render them so adding the @font-face code by hand will get you there. The good news for CSS3 and Font-face etc is that Dreamweaver can be extended very easily to add support for, even better news is that I have already written a couple of Extensions for Dreamweaver which can be downloaded for free from the Dreamweaver Exchange, you can also read a bit more about them on the Projects page of this site. I’m hoping to write on to add support for HTML5 tags too, with these extensions you’ll get code hinting support for adding these into your code. Please try them out and give me feedback as to how they can be improved and I’ll see what I can do to make them better. David Powers has also written an extension for adding / converting RGBa colour values too which is another handy tool, you can download it and other useful DW extensions from his Extensions and Tools page. Subversion version control support was added with Dreamweaver CS4, however I wasn’t very keen on how it was implemented and it lacked many features so I’ve continued to use alternative standalone apps for managing version control on OSX. Subversion support has been improved in CS5 though so it looks to be a more viable option now, I will try and give it a fresh comparison to see how it compares to the standalone alternatives now. One major difference in CS5’s support I believe is that Subversion can be upgraded without Dreamweaver itself having to be updated so this will help keep it more up to date. I’ve written about BrowserLab before, BrowserLab is a great way to test web pages in different browsers and Adobe has continued to improve it by adding more target browsers to the list as well as the ability to save local copies of the rendered previews as jpeg images. The integration of BrowserLab in CS5 along with all of the improved Live view rendering improvements makes for a great development environment. BrowserLab has been a free service so far as part of Adobe’s Labs beta program, it will however ultimately be a paid service but purchasers of CS5 software will get included access for a year. Standalone pricing has yet to be announced. All in all Dreamweaver CS5 is a great step forward, it’s definitely got some genuinely useful improvements to offer my own code-centric workflow especially that I’m now using WordPress for many projects. I’d definitely recommend giving it another look if you haven’t been using Dreamweaver for any of the reasons I’d previously mentioned. Adobe announced at their annual MAX conference that the next version of Flash CS5 will include the capability to publish iPhone apps, and in fact that there are several games in the App store already that were created using a pre-release version of the software. There’s been a lot of commentary on blogs that seem to think that Adobe have added this feature because they think that they may never get Flash as a plugin on the iPhone, indeed that this is some kind of ‘backdoor’ route for Flash on the iPhone. However, I disagree, I just don’t think that there’s any reasoning like that at all. While it is great that Flash developers will have a way to get content onto the iPhone now I think that the ability to create iPhone apps is a much better opportunity for them than having native Flash on the iPhone. Why? One simple reason: Money. A lot of people are willing to pay money for an iPhone app, but people are far less willing to part with money for Flash games that run in the browser. It simply presents a much better business opportunity for Flash developers. I’ve blogged a few times about Flash and how it seemed like an obvious tool for the job of a cross-platform means to provide protected streaming video, in particular for the BBC’s iPlayer in the UK. Many of the things I’d thought in those old posts have actually happened now, streaming Flash video is now used to provide access to the BBC iPlayer content on many platforms such as Mac OSX, iPhone / iPod touch, Wii, PS3 and other devices. Streaming Flash video is also used for Hulu.com in the US. In addition to the streaming option Flash is now used to provide a cross-platform downloadable iPlayer service via Adobe AIR’s protected runtime, so it’s all come a long way really. Of course no-one really likes DRM but at least it does provide a way to make all of this content available (geographic restrictions aside) without any major restrictions – apart from not being able to download directly onto the iPhone / iPod touch I suppose! Adobe has just announced a new version of a software developer kit called Flash Access 2.0 (previously known by the snappily named ‘Adobe Flash Media Rights Management Server’). One of the main features is that it will enable protection of files that can be played directly within the Flash player instead of requiring it to be wrapped within the Adobe AIR runtime. This will offer a lot more flexibility in that files can be played directly within the browser. The technology supports MPEG4 H.264 content as well as FLV files so the quality of video provided via this technology has the potential to be very good. 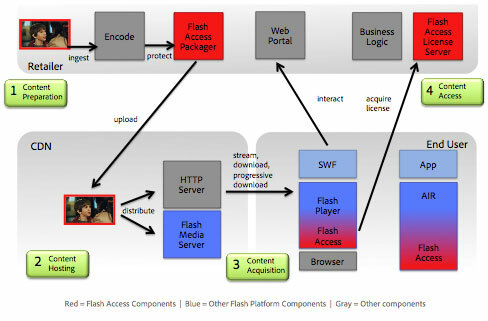 Example of Flash Access 2.0 workflow. I’m not sure if this has any real impact for services like BBC’s iPlayer as they already have a downloadable option via the AIR based iPlayer. It’s an interesting situation with distribution of digital video content really, DRM was a complete failure when it came to audio but there’s no sense that content creators are about to take the same approach as the music industry. Of course the big missing piece to the digital media distribution puzzle is that none of this Flash based content can be used or distributed to Apple’s iPhone and iPod touch platform. Time for Fairplay DRM to be broadly licenced? Although there’s some sense in supporting Flash video on the iPhone I think what could be a solution is for Apple to make their Fairplay DRM licencing available for others to use on their own websites, media stores etc. If we’re not likely to see media become completely DRM free then what is at least needed is any easy, cross-platform, cross-device method to distribute digital video content to whatever device is desired. At the moment the whole digital video distribution system is full of restrictions, dead-ends and political manoeuvrings by big media companies. I wonder if it’s going to take greater consumer unrest to finally force the various companies to work together for the greater good, to simply be able to play video content that you’ve paid for on any device you want? Especially if that device is an iPhone or iPod touch? At the moment it’s just “a bag of hurt“. P.S. Don’t anyone suggest Microsoft’s Silverlight as a solution, we don’t need yet another format for video distribution! This service / app has been in development for some time, Adobe actually showed a sneak peak of it back in November at their Max Conference under the code name ‘Meer Meer‘. So although this might seem like Adobe playing catchup with Microsoft’s recent ‘SuperPreview‘ release it’s actually nothing of the sort. If you compare BrowserLab with SuperPreview you’ll see that they’re quite different apps – primarily that SuperPreview is a Windows app that only let’s you preview IE6 and either IE7 or 8 depending on which is installed – and of course requires you to be running on Windows to use it whereas BrowserLab is a browser based application that simply requires the Flash plugin and therefore works on both Windows, Mac and Linux. So a good range of browsers are covered, although IE8 really needs to be there along with Opera as well to really cover all the main desktop browsers. Although there isn’t yet as big a range of browsers to test in compared to other services like Litmus, BrowserLab has a benefit in that it provides some additional tools to help you compare the preview of your site in the different browsers. 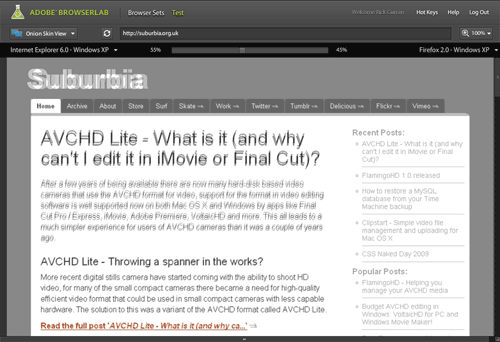 Browser Sets in BrowserLab – Only preview preferred browsers. Browser Sets in BrowserLab basically let you create groups of browsers that you want to have rendered when testing. This can save time over just having every browser preview rendered for your site, if you only want to see IE6 and IE7 then you can create a BrowserSet with only those contained in it. You can view a 2-up layout that lets you compare the differences between rendered previews. This creates a side-by-side view displaying two different browsers which you can quickly switch between to compare different browsers. You can also zoom up to 200% to compare the previews more closely and also zoom out to 75% to get a more overall comparison. The Onion Skin view lets you compare two different previews but overlays them on top of one another. You can then use a slider to fade between the two selected browser previews, if you’re trying to work on something quite pixel accurate then this can be quite useful – although it has to be said that exact pixel placement accuracy of page layouts isn’t necessarily something to worry about. It’s still a pretty useful feature though. One other feature benefit that BrowserLab has over other services such as Litmus is that there is a Dreamweaver CS4 extension that allows you to test your site layouts directly from within Dreamweaver. The added benefit here is that this avoids the step of having to make your entire page live on the web before testing as it works with just the local files on your system. As a beta release BrowserLab looks pretty good, although it does have some hot competition from services like Litmus and Browsershots – especially in regards to Litmus’ push towards supporting mobile Safari on iPhone / iPod touch. To checkout BrowserLab for yourself, read more about it over at the BrowserLab pages at Adobe Labs website.